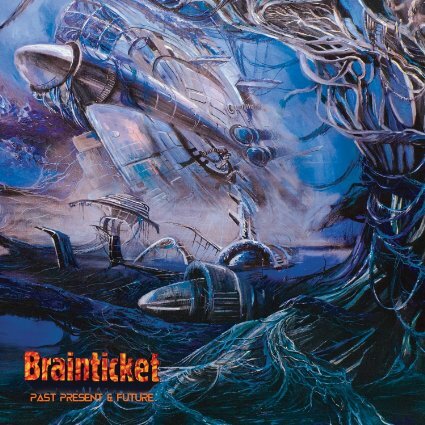 It’s been 15 years since the last new Brainticket album – Alchemic Universe, released in 2000. Fast forward to 2011 and Brainticket founder and ship commander Joel Vandroogenbroeck teamed up with members of Farflung and Pressurehed, plus Abby Travis on vocals to join the Cleopatra Records sponsored Space Rock Invasion tour that brought Brainticket, Nektar and a solo acoustic Huw Lloyd-Langton to the U.S. I caught the tour in Cleveland I am not exaggerating when I say that Joel and company put on one of the best live performances I have ever seen (CLICK HERE for some YouTube videos). I also had the opportunity to interview Joel, who indicated that he was hoping all the activity and visibility would result in an album of new material. It took almost four years but it’s finally arrived. Vandroogenbroeck isn’t joined by the musicians who accompanied him on tour in 2011, but instead we have the excellent Hedersleben, the same band who backed Nik Turner on this past year’s U.S. tour: Nicky Garratt on guitar, Bryce Shelton on bass, Jason Willer on drums, Kyrsten Bean on guitar and vocals, and Kephera Moon on keyboards and vocals. Maybe this is Cleopatra Records new Space Rock house band? And of course we have Joel on organ, piano, synthesizers, sitar and flute. Joel’s magic sitar leads the way on the Psychedelic Space-Raga rocking Reality of Dreams. Proto Alchemy is a majestically plodding Space-Prog instrumental with a cool combination of doomy bassline and Jazz jamming keys. Riding the Comet starts off like the perfect theme song to an old sci-fi TV show, before morphing into a good time swinging slab of cosmic dancefloor fun. East Moon consists of grandiose, concert piano led symphonic rock. Singularity alternates between high intensity Space-Prog with alien efx’d spoken word and hypnotically dreamy melodic segments. Egyptian Gods Of The Night Sky has a Book of the Dead type narrative theme, with music that is both Psychedelically dreamy and hauntingly dissonant, making for an alluring blend of Kosmiche and Avant-Prog. Finally, Brainticket Blues is precisely that… sultry Blues with a jazzy cosmic edge. In summary, Brainticket 2015 mines territory that will be familiar to fans of the 70s albums, but have not contented themselves with a mere retro experience. Vandroogenbroeck has collaborated with an ace ensemble of musicians to create music that draws on the past but is heavily informed by many of years of experience since. I think its damn good.